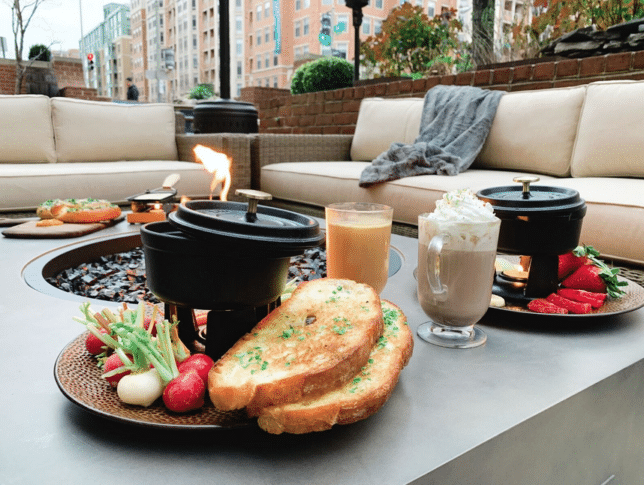 The new outdoor space, called the Fire Garden, is open weekdays from 5 p.m. to 10 p.m. and on weekends from 1 p.m. to 10 p.m.
WASHINGTON — Blue Duck Tavern, at the Park Hyatt in D.C.’s West End, doesn’t see any reason why you can’t enjoy patio seating in the colder months. The restaurant just opened its Fire Garden. The new outdoor space, with fountain, is a sunken garden with fire pits and comes with blankets for guests to stay warm, and fondue to make it winter-cozy. The Fire Garden is open weekdays from 5 p.m. to 10 p.m. and on weekends from 1 p.m. to 10 p.m.
Blue Duck executive chef Adam Howard has put together a Fire Garden menu that includes Bavarian pretzel with melted raclette, chocolate fondue with fresh fruit, cheese fondue with vegetables and toasted country bread and Short Rib Tartine with horseradish aioli and pickled onions. Eating al fresco at Blue Duck’s Fire Garden this winter will cost from $14 to $26 per dish. There are also $16 cocktail concoctions, all made with at least one ingredient or garnish from the Park Hyatt’s rooftop garden. Fancy cocktails not your speed? Beer and wine by the glass is $8 to $19. Blue Duck Tavern, which just earned a one-star rating in the 2019 Michelin Guide and has a 3-Diamond rating from AAA, serves breakfast, lunch, dinner and weekend brunch, inside, where it’s warm.